Ⓐ Scanned area behind the vehicle. Yellow segment depicts an obstacle. Red segment depicts an obstacle located close to the vehicle. Black segment depicts an obstacle (monochrome display). The area to the rear of the vehicle is scanned by the ultrasound sensors and is shown on the display of the factory-fitted radio or navigation system. 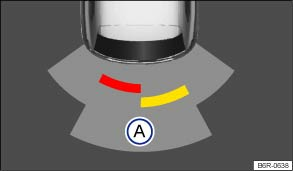 The positions of potential obstacles are displayed relative to the vehicle . Acoustic signals are given when the vehicle approaches an obstacle located to the rear. An intermittent signal tone is given if a sufficiently short distance between the vehicle and an obstacle is detected. The shorter the distance, the shorter the intervals. The signal tone will sound continuously if the obstacle is very close. If you continue to drive the vehicle closer to the obstacle despite the continuous signal tone, the system will no longer be able to measure the distance. With some vehicle equipment levels the scanned areas are displayed as several segments in a display or . The closer the vehicle drives towards an obstacle, the closer the segment will move to the vehicle in the display. The collision area has been reached when the penultimate segment is displayed, if not before. Do not drive on! The distance range for the constant tone is larger for vehicles with factory-fitted towing bracket. The acoustic signals for the ParkPilot can be muted by touching the function button on the screen (in colour display only). Touch the function button again to switch the acoustic signals back on. It can take a few seconds for the acoustic or optical signals to be given.